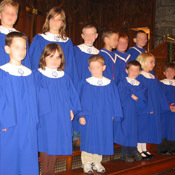 The Junior Choir is for any child in grades 3 – 8. Rehearsals are on Wednesdays from 5:45PM to 6:30PM starting in mid-September through mid-May. The Junior Choir sings once a month from October through May during Sunday morning worship. The choir also sings at the annual Candlelight Carol Service and the Christmas Eve Family Service each December. The Junior Choir also reaches out to our community and about twice a year sings at a retirement home. The choir has also participated in choir festivals with other area church choirs and given a musical in the Spring based on a Biblical story. Again the fundamentals of reading music and rhythms are taught. Sight singing is a part of each rehearsal. The children learn about the church year as all of their music relates to each season of the church. A deeper appreciation for the hymns of our church is also an important part of the choir. The service award program is begun with the Junior Choir and continued through grade 12. For each year of choir service, a colored ribbon is given with a bead representing the number of years in the choirs and their level of participation. New members are welcome at any time throughout the school year. The Youth Choir is for any person in grades 9 – 12. Rehearsals are on Sundays from 11:15AM to 11:45AM from mid-September to mid May. The Youth Choir sings in worship about every six weeks and at the Candlelight Carol Service and the Christmas Eve Service in December. The service award program is continued through grade 12 (as described under Junior Choir). Most of the music sung is in two or three parts as well as some unison music. New members are welcome at any time. The Sanctuary Choir is for any person in grades 7 through Adult. Rehearsals are every Thursday evening from 8:00 PM to 9:30 PM starting in early September through early June. This choir leads the music each Sunday morning at the 10:00 AM service from September to mid-June. The choir also sings at the Candlelight Carol Service and the late Christmas Eve Service as well as the Good Friday Service in the evening. The Sanctuary Choir is made up of volunteers who enjoy singing. New members are welcome at any time. Carmel’s handbell choir is an inter-generational choir and is open to people from Grade 5 to adult. If you have a good sense of rhythm and coordination then you are a good candidate for the bells. Carmel owns five octaves of handbells and three octaves of handchimes. Rehearsals are on Monday evenings in the choir room from 7:30PM to 8:30PM beginning in mid September through mid May. The handbells ring in worship about every six weeks. The bells are co-directed by Heather Coelho and Abby Palmisano. If you are interested in becoming a ringer, contact Abby at 215-887-1074 (press 3).